You’ll notice that the title is in passive voice so no one actually is implicated in the doing. I have to write a bio for my husband for a con. He’s going to be on a panel about being married to writers. I plan to lie. Totally and completely. I need to go through and delete buy links for some of the books and put in some explanations about when and how things will be available. For instance, The path books are currently unavailable new or in ebook. However, the ebooks will be coming back soon with new covers (from Open Road Media). After that, I will hopefully put together the print versions and have them available. I can’t begin to tell you what I need to do in my yard and around my house. I keep plugging away. I need to finish reading this book that I have and want to read. I need to brush the dogs and trim nails. 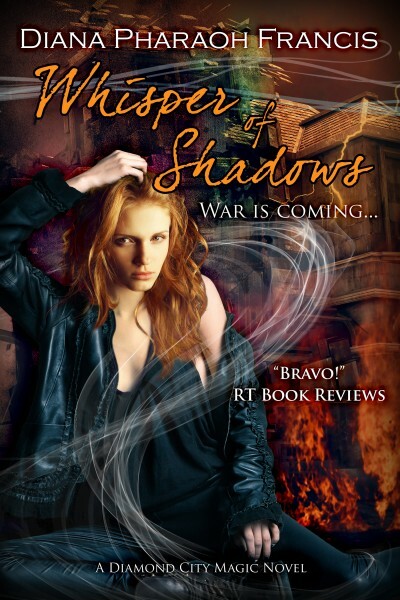 I need to show you the new cover for Whisper of Shadows! It’s so pretty. It is up for preorder for ebook form now. The print book will be available soon, I think on the release day, April 22nd. This entry was posted on Thursday, April 7th, 2016 at 7:24 pm in Diamond City Magic, my life, Novels, Promo, publishing. Tagged: Diamond City Magic, life, Promo, publication, Whisper of Shadows. You can feed this entry. Both comments and pings are currently closed.